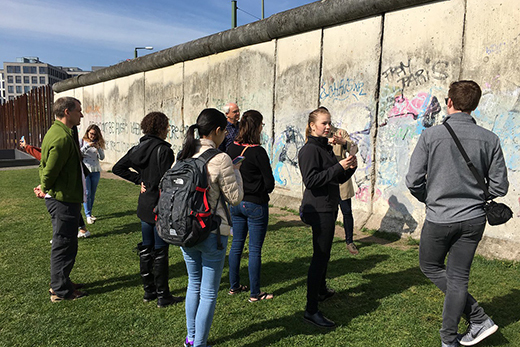 In Berlin, Global Connections students visited areas connected to the city's divided past and its embrace of global issues, including a remainder of the Berlin Wall. Photo by Jacob Hicks. A recent Oxford College trip to explore modern issues of religious protest and reform was inspired by a 500-year-old event. The germ of the idea for Global Connections 2017, which took a group of seven Oxford students and their leaders to Berlin, Germany, and Oxford, England, came to Oxford College Chaplain Lyn Pace two years ago. Global Connections trips are planned well in advance, and he was contemplating future themes and destinations. Global Connections, a student-travel experience begun in 2006, is a program of Oxford’s Office of Religious and Spiritual Life, which Pace heads, and supported by the Pierce Program in Religion. Global Connections has a mission of helping students connect religious and spiritual convictions with justice issues such as peace, poverty, human rights and the environment. Past destinations have included Montana, Vietnam, the American South, New York City, Japan, and Poland. Pace’s Global Connections co-leader was Florian Pohl, Oxford College associate professor of religion. As the two began designing the trip they realized that the Protestant Reformation alone was too narrow a focus. Instead they designed a trip that would honor the 1517 milestone while also looking at protest and reform from other perspectives. Beginning their trip in Berlin, the group experienced the city’s vibrancy as the capital of Germany and as an artistic and creative center, but they also visited areas connected to Berlin’s divided past and its embrace of global issues. A trip to a remainder of the Berlin Wall was contrasted with a Shabbat dinner with members of Berlin’s Jewish community and a tour of the Memorial to the Murdered Jews of Europe. Sarah Sattano, a rising sophomore, was impressed that the memorial saw those who died in the Holocaust as individuals, not numbers. Also on the itinerary was One House, a project set to open in 2019 and intended for children of different faiths. One House will encompass a synagogue, a mosque and a church in one building. The group volunteered at a shelter for Syrian refugees, sponsored by Volkssolidarität, a refugee assistance organization. The German schedule concluded appropriately enough with a trip to Wittenberg to see the Castle Church, where tradition says Luther nailed his 95 theses, and other important sites of Protestantism. Global Connections’ counterpart city was Oxford, England. Oxford College enjoys a special relationship with Oxford University through the Pierce Visiting Scholar Program, an academic exchange in place since 2005, in which one faculty member from Oxford University and one from Oxford College are each guest lecturers at the other’s institution. The group met with Mohammad Talib, the 2017 Pierce Scholar, who was on the Oxford College campus this past March. Talib is the Sultan bin Abdul Aziz Fellow in the anthropology of Muslim societies at the Oxford Centre for Islamic Studies and the Islamic Centre lecturer at the Institute of Social and Cultural Anthropology. An idea related to Christian Protestantism eventually grew into a far-reaching experience across several faith traditions. Jacob Hicks, a rising sophomore, was the Global Connections unofficial photographer. A series of his photos is available in an online gallery. On June 15, Pace announced plans for Global Connections 2018, a trip to Vietnam led by sociology professor Mike McQuaide that will focus on diversity, development and the global economy.